Embedded in the mission statement is a call to develop women into activists trained on the issues in their community, and the mean by which to create effective action. Together, these lead to changes in the lives of those around them. 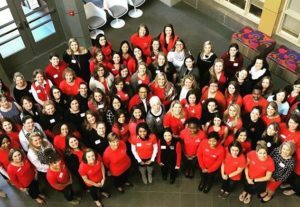 Starting in 2012, the Junior League of Hampton Roads has created a formal training requirement and program in order to encourage and develop its members. Past trainings have included elevator speech round tables, financial literacy seminars, first aid training, human trafficking briefings, and even book discussions. The League also sends its members to various AJLI conferences throughout the country in order to network with Leaguers and to learn more about how to most effectively induce change. Conferences include the Virginia Leadership Summit, Organization Development Institutes (ODI), AJLI Annual Conference, and AJLI Leadership Conferences! In October 2016, the JLHR sent several delegates to the first annual Virginia Leadership Summit! The purpose of this meeting was to train Leaguers on advocacy, and how this can be done with the resources that the League has to offer. It also provided members to share the projects that their own League has done, and generate new ideas about what can be done to help the state as a whole. Speakers included renowned AJLI presenter Vicki Clarke.